Every Hang-A-Plan Binder is hand assembled and tested to meet strict quality standards. If any components prove defective under normal use, they will be replaced free of charge. 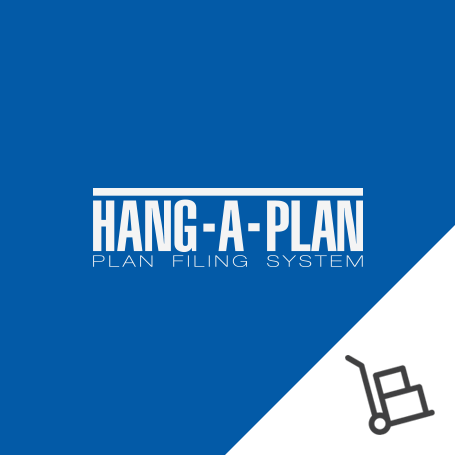 Hang-A-Plan offers two types of Planbinders; the GENERAL binders and the QUICKFILE binders. Versatile General plan trolleys can store up to 3000 sheets over 20 binders. All stored sheets are easy to locate, access, remove and transport. All plan trolleys and wallmounts use the Universal Front Load System that allows clear easy access to all binders without obstruction. Trolleys can hold multiple binder sizes which can be also interchanged between all the wallmounts. Three trolley sizes now available.